We are more than satisfied with the service provided to us yesterday. The 2 technicians were very professional from the beginning to the end. They were very accommodating with a another company delivering furniture at the same time !! We also appreciated the recommendation for our furnace and dryer. Thank you again. WE BREATH BETTER AIR now!! Gravity Duct Cleaning Services a livré un excellent service de nettoyage de conduits de fournaise et de sécheuse. J’ai reçu rapidement un estimé des coûts pour les services demandés (et ce qui est compris) ainsi que des dates de disponibilité et explications claires comment ils procéderont – et c’est exactement ce qui a été livré. Les deux travailleurs étaient très professionnels, polis et gentils et prenaient le temps de répondre à mes questions. Ils s’occupent de bouger tout ce qui doit être bougé pour bien accéder aux ‘bouches d’aération’ à travers la maison – et ils replacent le tout, comme si rien était! 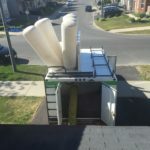 En plus que mes conduits soient maintenant tous propres, ma maison est encore plus propre qu’avant que l’équipe soit arrivée, car avant de quitter ils passent l’aspirateur partout sur leur passage. Je suis très satisfaite de leurs services et n’hésite pas à recommander Gravity pour vos futurs nettoyages. Thanks for a great service from beginning to end! On October 9 we use Gravity Duct Cleaning to clean the duct. The two technician arrived on time, the were very professional and answered all our questions. When they were done they did a very good job at cleaning up. It did not even look like they had been here. We would highly reccomend them. We are very pleased with the quality of work by Gravity technicians. They were incredibly professional, courteous, and thorough. We feel very confident we hired the right company and won’t hesitate to spread the word. Thank you! A friend Reffered me with Gavity duct cleaning after I told them I was buying a house and the previous owner had pets and has not cleaned his duct for don’t know how long. But I was glad I chose them because my new home/House now has the fresh new house smell no more urine and pet smell. It was easy company to deal with and straight forward with pricing, If you are still thinking who to pick don’t think anymore call them and you will be happy you picked them. First time using Gravity. The two men were courteous, friendly and very efficient. I was very impressed with the quality of the work, and the informative nature of these two workers. Any question I asked they answered in complete detail and provided additional info that I had no idea about. When finished they mad sure I was satisfied and did a complete cleanup of my home. I highly recommend this company to anyone who is looking for a good duct cleaning company. Rob and Tunde were out to our house yesterday for our first duct cleaning by Gravity. This is the second cleaning we have had done as home owners and the difference between the two providers was remarkable. From their arrival we could see a significantly higher standard in Gravity than with our previous provider. The quality and appearance of their vehicle, the high standard of their cleaning and power tool equipment to their personal courtesy and politeness projects professionalism. Their cleaning procedures were clearly much superior to their predecessors, even to our untrained eyes, and their attention to detail in both the main job and the site cleaning (i.e. flooring around the ducts, sealing of holes bored into ducts) was impeccable. We will not hesitate to call Gravity back for future jobs as they easily won our loyalty through the actions of Rob and Tunde. Thank you gentlemen. The technicians were very nice and professional. The job was done to our satisfaction. If anyone is looking for duct cleaning we would definitely recommend them to everyone! Also scheduling an appointment was easy, all our questions were answered right away and the quote was sent immediately (even though we did contact them late evening). These guys will take all the necessary precautions to protect your home interior before proceeding. They will ensure the furnace works properly after ducts are cleaned. Very professional and courteous. Certainly I recommend them. I was offered an opening for an earlier appointment than originally set up which was very welcomed considering how the days were getting cooler fast. Service and after-service cleanup were extremely well done; very punctual, friendly, courteous and professional service. I had also requested a dryer vent cleaning – which was tricky as there is very limited space to access the tubing from behind my dryer – but the technician took the extra time and effort to unhook it from my dryer, clean it thoroughly, and reattach it properly to the dryer. The other technician also went outside and cleaned the same vent from the other end. I am very pleased with the service and definitely recommend this company to anybody looking for excellent service at a very competitive price. The guys came in on time, were courteous and answered questions patiently and professionally. After they were done they cleaned up any dust that may have been caused by the duct cleaning. The ducts were so clean! Very pleased. The furnace and AC maintenance was very professional. The technician who came was thorough and explained every step of the way what he was doing and why. I will only be calling him again for any maintenance or repairs to my furnace or AC. Thank you for the quality work and service that your company provides. The job very well done. Highly recommended. The Gravity staff were very professional and knowledgeable. They did a thorough job and left no mess behind. They took their shoes off at the front door and were very careful when bringing equipment into the house. They also successfully unblocked my dryer vent. The price and service was great! The technicians were very professional and diligent. The house smells great and I couldn’t believe the amount of stuff that was removed from the vents and the trunk lines. We were very pleased with the service received. Thanks for the great service as well as your outstanding furnace Technician. Very professional service all the way across the board. Gravity Duct Cleaning provided excellent service. The service associates were great, professional and explained the complete cleaning process. The team is very professional. They know what their job is. Definitely to be recomended to friends! The team was very professional and did a good job. After obtaining some quotes and researching duct cleaning services in Ottawa, we decided to use Gravity Duct Cleaning. From the initial quote, to the email confirmations, the excellent service before and during the service, we are so happy to have found Kevin and his team. Reliable, thorough, professional, well-organized, courteous and well-priced! Thank you for your service – we have referred you to two people who were equally impressed with your service – my Mum is next 🙂 Thanks to Kevin and the team! I was looking to find a company that was not overly expensive and had good reviews. I found that with Gravity Duct Cleaning. Everything was explained to me in advance and there were no hidden charges. They were very thorough and professional. I’ve already recommended them to others. I am very satisfied with the service. The two technicians did great job and they were very professional. Highly recommend Gravity to anyone who needs the service. With so many companies out there it’s hard to know who to go with. Luckily a friend had used and recommended gravity duct cleaning. I can attest to their thoroughness, professionalism and flexible service. Happy to recommend these guys ! These two guys did a very clean, friendly an professional job. I am very satisfied. I rarely do reviews online as I am hard to please when it comes to services. James and Raoul did a fantastic job at my house. Not only did they perform the work as advertised, they were also very polite, careful with furniture and left the place very clean! I already recommended this company to my friends. 100% satisfied. Thanks guys. Great service – the two gents I had were nothing but professional and down to business. They made little mess and we’re all about keeping it that way. My house smells clean and it already feels like a difference has been made! Will use again and share with friends. I had asked for a complete duct cleaning of my condo and for the dryer duct to be cleaned. When technicians arrived, they first checked the heating duct system to evaluate if they were very dirty. They found out they were clean and in no need to be cleaned. They were very honest and told and showed me the situation. They didn’t charge me for this. They did a great job at cleaning the dryer duct. Very conscious and knowledgable technicians. Great service, really good results……..
Great service, really good results, big difference in our home. A+++ Highly recommended. We are very happy with the service provided…. We are very happy with the service provided. Excellent service with courteous employees that were fantastic. We have posted our fabulous experience on Facebook along with a link to your website with a glowing review of the work that was done. I can’t say enough good things about this company’s service. I was a little worried because their price was the lowest of all the companies I called, but they provided the same service if not better. They met and exceeded all my expectations: they arrived on time, they answered all my questions, they were courteous and very professional and There was no mess left behind. The guys even showed me the blockage in the dryer vent and explained how it could be a fire hazard. The house smells great and feels fresh and my dryer doesn’t take as long to dry clothes now. Real professional job. I booked last week, and the crew arrived today right on time. My house is 2100 sq ft and it took them around 2 1/4 hours. They back a rather huge truck into your driveway and connect a large hose to your furnace. The truck supplies the vacuum and it clearly works because as they are cleaning the vents, the whole house pretty much shakes from the force of the vacuum. I was really impressed with the attention to detail the crew displayed. They brought a number of additional smaller vacuums into the house and were careful to clean up most of the dust caused by the cleaning. Note that the noise of the cleaning is fairly loud so the next time I get this done I’ll have the pets relocated temporarily as the noise surely freaked the cats out. I did a fair bit of research before booking this company and I was glad I did – they certainly have the right gear to clean the vents. If you search on youtube, you’ll learn that some companies only have small hand vacuums that are certainly no match for the suction that a truck can supply. Once I turned my Air Conditioning back on I noticed more air flow, so there’s another bonus! Less dusting and hopefully more efficient AC. I was very happy with the service provided. They were prompt, covered up the air vents so the dust doesn’t blow onto furniture etc and they cleaned up the dust that was on the floors afterwards! They showed real care in the work they did which I appreciated. Kevin and his worker did a fabulous job today cleaning our ducts. They were very professional, friendly and took great pride in what they do. They were also very respectful of our home. We were very pleased with their work and would most definitely recommend them and use them again in the future. I thought their service was great. Quick and did a good job. Very professional & excellent work provided. I highly recommend this company. Great job! Your team did a great job. We are very happy with your work. I have introduced you to my sister she will call you soon. Thank you for good service. Reliable company with a very good service…. This a reliable company with a very good service. A team of hardworking technicians. I was completely satisfied. Gravity Duct Cleaning is Pro in the job and the timing…..
We had our ducts cleaned this past weekend by Gravity Duct Cleaning Co. The people who were doing the work were pro, both in the job, and the timing. We strongly recommend them. It was a pleasure dealing with them. They were easy to work with and very professional. I appreciated how careful they were moving the hoses around the house, and taking shoes on and off when they went outside. The house smells great and I couldn’t believe the amount of stuff that was going through the hose. Highly recommended. I was very impressed with the quality of service received from Gravity. The technicians were professional, timely, and efficient. Also, they offered me a great price on the service, where as other providers quoted me with a much higher amount. I would highly recommend Gravity for anyone who is in the market. The technicians were very professional and diligent. They did very good job and after they left there was nothing that I needed to clean, fix, or adjust. Also the price for the service was very reasonable. I am really very pleased with the work the guys from Gravity Duct Cleaning Services did!! They were on time…..professional with a smile….. They were on time, professional, and offered a good price for the entire house. Very clean and service with a smile. Excellent Service! Very thorough and clean! Highly Recommend. Just click below and write a testimonial.